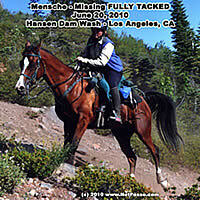 Mensche, a 12 year old bay Arabian gelding with four white stocking and a full blaze, measuring 15.2 hands, became missing during a trail ride June 20. The seasoned endurance horse was startled when a dog ran underneath him. Gamble became dislodged and Mensche broke free, taking off with the dog chasing him. Gamble searched the nearby area, but was unable to find any sign of Mensche. The dog’s owner reported he had come home, but the spooked horse was nowhere to be found. George would like to say “THANK YOU” …. the community outreach and the efforts involved in the search were definately heart felt.